The WikiPad, the Razer Edge Gaming Tablet and the Fabled Smach Zero (which is due for release in Q4 2016) have all have thrown their hat into the Mobile Gaming Market, but to what end? 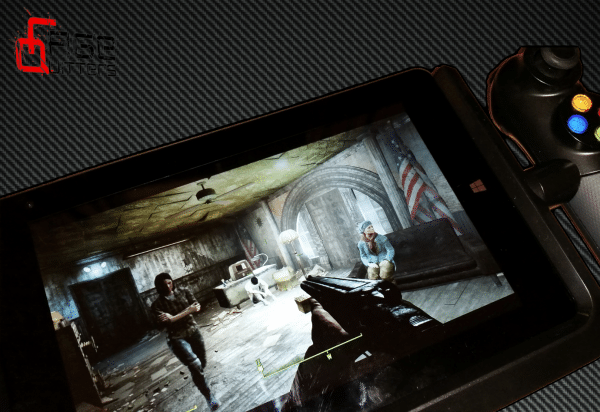 Here comes Linx with their own take on things, with the Linx Vision Gaming Tablet! 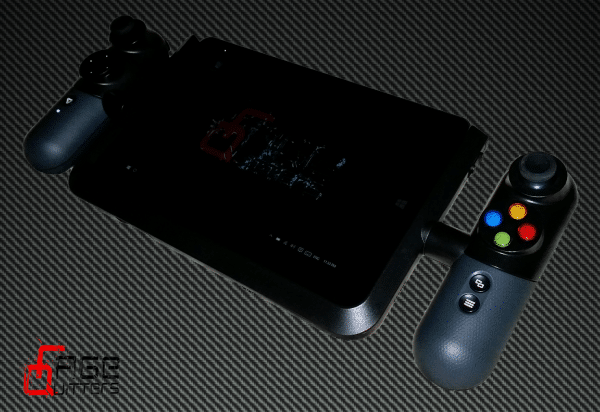 A relatively unknown company outside of Europe has come out with the Linx Vision Gaming Tablet. 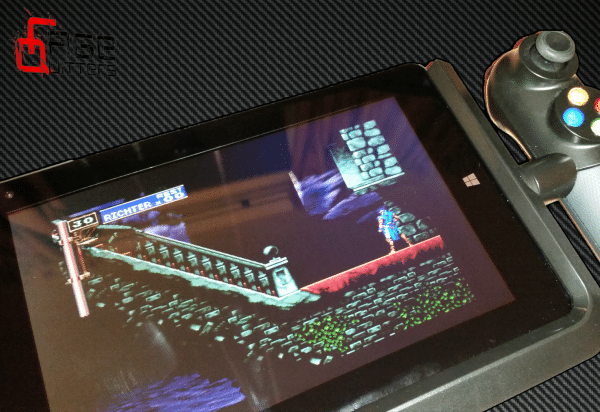 An 8”, 32GB, x86 based tablet that has a dockable controller unit that supports both HID snd X Input control schemes. I bought mine from Ebuyer at the pretty penny of £149.99. The tablet itself feels well built, feels nice in the hand, is responsive with Windows 10, and all round, for an x86 based tablet in the 8” category, The Vision Gaming Tablet is not bad at All! At the heart of the unit is an Intel Cherry Trail x5-Z8300 Quad Core CPU, that can turbo up to 1.84GHZ, has 2GB of RAM built in and internal 32GB of flash based storage. Storage is expandable Via Micro-SD cards up to 32GB (yup, no XD support mentioned), has WI-FI supporting B/G/N & AC standards, Bluetooth 4.2, A 4 pole 3.5m headphone jack that uses the Nokia standard, So you can use any headset that uses it (including microphones), has stereo speakers and the standard volume rocker and power button on the top, as well as the built in microphone. On the bottom of the device there is the headphone socket, micro USB for charging, and micro HDMI for another video output & 5 contact points for the controller dock. On the front and rear of the unit are the 2 Cameras, Both at 2MP, not great, but its nice to have for Google Hangouts or Skype. The display is an IPS panel running at a 1280×800 resolution with 10 point multi-touch, and is sharp, clear and bright. And to top it all off, the Tablet has a 6000 MAh Battery, which will rock you in at about 4 to 6 hours of use (depending on the task of course). So what can you expect to get out of one of these 8” tablets? Well, depending on how you use the bugger, a fair amount (if you have the supporting hardware that is). 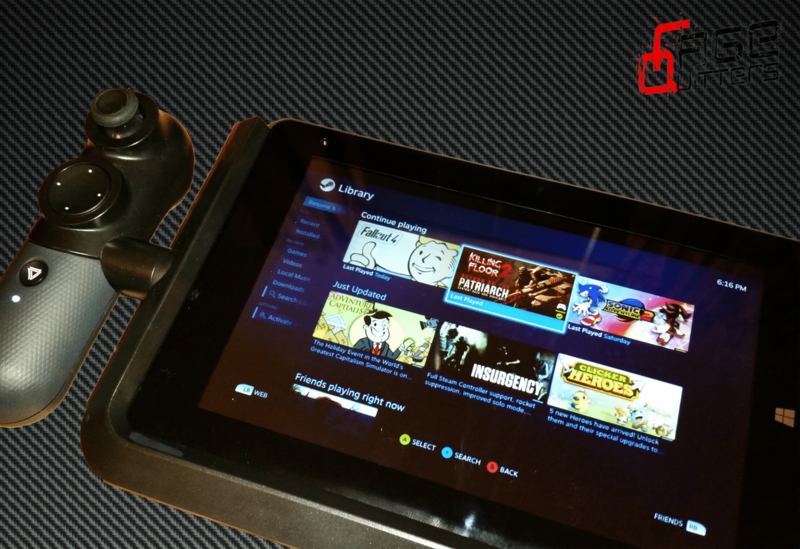 The thought behind this tablet is to use it as a Streaming Terminal, either with the Xbox One, Or a PC with Steam installed, using it in a similar fashion as the Wii-U (insert Police Siren here) and its game-pad. The Vision Gaming Tablet is equipped with AC Class WIFI, So if you have a supporting router, you can get very fast streaming video with No Issues at all. As I don’t have an Xbox One, I’ll be basing my views on game streaming using a PC equipment with a rather well stocked (Bowchickawowow) Steam account. As I expected, getting streaming to work with Steam was an easy task and just required me to install the Steam Client on the device and signing in, making sure the device showed up in the in-home streaming options on the main PC. I left the settings at default, setting the bandwidth to automatic, and resolution limit to 720p and went about testing Games. Any game that natively supports the Xbox controllers (360 and One) worked flawlessly. Some games required me to select the controller as the main input, but some games (like Sonic Generations) required some fiddling before this would work. So, what games worked? Well, MOST of the Games I own work fine. There was a few that didn’t out of the box, anything that’s Source based needed some twiddling before it would play as it should on its console counterparts. Killing Floor was a no go, But Killing Floor 2 worked from the get go. Sonic Adventure 1 and 2 (for those that gotta to go fast) worked just fine. Borderlands 1, 2 & Pre-Sequel worked perfectly. The jist of it, if it supports 360 controllers natively, you should be golden! Fallout 4 being Played Via Steam’s Game Streaming. You have a quad core tablet, with a decent display, expandable storage, and a decent input control scheme, what else can you do with this beasty? This tablet will pretty much do anything up to The N64, and handheld-wise, anything up to the GBA (which was a main point of me buying one). One aspect I was worried about was PSX emulation (because Symphony of The Night) but I was completely floored by how well ePSXe runs on this thing. After dumping my copy of the game, dumping my bios from my console and setting up the controls, It was a dream to play, I can now, sitting on the throne, play my PSX classics! N64, however, was a bit of a dog. Not by the performance, but the niggles with the copy of Project 64 I was using and the GPU driver. The screen would auto rotate when entering fullscreen mode, after about 20 minutes of fiddling, I couldn’t get past this issue, unless I played in windowed mode, bugger that for the price of fish. Pretty much all of your major 16 bit machines are gonna run just fine with no issues, so consoles like the Super Nintendo, Sega Mega Drive (Genesis for you Yanks!) and the Neo Geo AES. So, the TL:DR, You have a 8” tablet with a lot of potential uses, with decent connectivity, and a decent screen, built in storage can be a little lacking, but with the ability to add MicroSD cards, its really not an issue. While the controller dock works great, and offers both HID Input and Xinput functionality, it feels like it could have been made a little stronger, as it tends to flex a little bit when holding it by one side on its own. Great review – I’m considering picking one of these up tomorrow, mostly for emulators. May I ask if you had any issues configuring ePSXe with regards to video plugins? Thanks very much! There was No issues with plugins reguarding ePSXe at all. Bought one this afternoon on the strength of your review and can agree with everything you have said. The only thing I would add is that the d-pad doesn’t have much travel (less than a millimetre) so takes a bit of time to adjust to – but seems to work well enough.